The potential risks of bee-venom therapy outweigh the benefits. The name alone is enough to make most of us shy away from this very unusual therapy. It seems counterintuitive to consider that something seen as poisonous could actually be curative. However, the sting of bees has been used for centuries to treat and cure a wide array of ailments. Just one member of the group of therapies known as apitherapy (the use of any product from or part of a bee), bee venom is actively researched for its treatment potential in conditions involving inflammation and autoimmune dysfunction. This discussion will focus on the use of bee venom as a palliative or curative measure and not as a desensitization technique in bee-sting-allergy therapy. Composed of peptides, enzymes, and biologically active amines that include histamine, dopamine, and epinephrine,2 BVT can be administered by application of a topical bee-venom compound, use of acupuncture needles to inject minute amounts of bee venom, ingestion of a bee-venom compound, or iontophoresis after topical application of the extract. 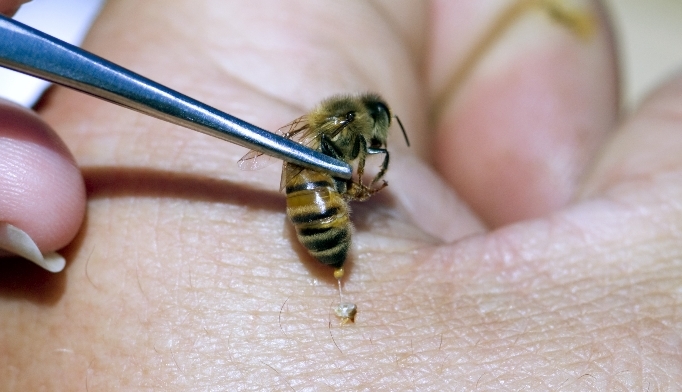 It can also involve allowing a live bee (or bees) ordered from a bee breeding center to sting the affected body area, after testing the patient for potential allergies. The most documented benefit of BVT is in the reduction of pain and inflammation in both osteoarthritis (OA) and rheumatoid arthritis (RA). Several randomized, placebo-controlled trials have considered the safety and efficacy of BVT for OA and RA by measuring levels of joint stiffness in the morning, pain and swelling in the joints, and laboratory values for erythrocyte sedimentation rate (ESR) and C-reactive protein (CRP). One trial involved 80 patients with RA who were assigned to either BVT or control therapy.3 In the treatment group, injections of bee venom were administered twice weekly for 2 months at the proximal and distal phalangeal joints. Baseline assessments of the pain parameters and laboratory data were then compared between the 2 groups. In all outcome measures, BVT showed statistical significance over control therapy.3 Another trial examined the effect of BVT in OA of the knee; 60 patients were randomized to either BVT or traditional acupuncture.4 Treatments were performed twice weekly for 4 weeks. More than 82% of the patients who had been treated with bee venom reported substantial pain relief, compared with 55% of the patients who had been treated with traditional acupuncture. Bee venom and bee-venom products should be considered potentially dangerous. In the United States, an estimated 2 million people are allergic to bee stings, and an average of 100 Americans experience fatal reactions to bee stings every year.10 Patients should have an epinephrine injection pen with them if they plan to attempt the therapy at home, but this is not advised due to the potential risk for serious reaction. The cost of BVT is difficult to ascertain and depends on the source of the therapy. Traditional health insurance does not cover BVT, since this treatment is still considered experimental in the United States. For acupuncture-based BVT, purified bee venom is used. Many proponents of natural medicine recommend using a live bee to sting the site, but this can increase the risk of infection. Some products are capsules of lyophilized bee venom, taken orally. This formulation is, however, not as well-studied as are techniques that deliver the venom via injection or acupuncture. In spite of some impressive statistics, BVT is still very low on the list of safe and effective treatments. The risks and discomfort associated with these therapeutic methods greatly outweigh the potential benefits. Clinicians should discourage patients from using BVT in general but they should especially discourage the use of BVT without professional medical oversight. Son DJ, Lee JW, Lee YH, et al. Therapeutic application of anti-arthritis, pain-releasing, and anti-cancer effects of bee venom and its constituent compounds. Pharmacol Ther. 2007;115(2):246-270. Kwon YB, Kim JH, Yoon JH, et al. The analgesic efficacy of bee venom acupuncture for knee osteoarthritis: a comparative study with needle acupuncture. Am J Chin Med. 2001;29(2):187-199. Nam KW, Je KH, Lee JH, et al. Inhibition of COX-2 activity and proinflammatory cytokines (TNF-alpha and IL-1beta) production by water-soluble sub-fractionated parts from bee (Apis mellifera) venom. Arch Pharm Res. 2003;26(5):383-388. Lee WR, Kim SJ, Park JH, et al. Bee venom reduces atherosclerotic lesion formation via anti-inflammatory mechanism. Am J Chin Med. 2010;38(6):1077-1092. Behroozi J, Divsalar A, Saboury AA. Honey bee venom decreases the complications of diabetes by preventing hemoglobin glycation. J Molec Liquids. 2014;199:371-375. Oršoli´c N. Bee venom in cancer therapy. Cancer Metastasis Rev. 2012;31(1-2):173-194. Wesselius T, Heersema DJ, Mostert JP, et al. A randomized crossover study of bee sting therapy for multiple sclerosis. Neurology. 2005;65(11):1764-1768. Tang ML, Osborne N, Allen K. Epidemiology of anaphylaxis. Curr Opin Allergy Clin Immunol. 2009;9(4):351-356. All electronic documents accessed January 1, 2015.